Eeeeepers. Why did no one mention it is Thursday today? I have way too much to fit into the two days before the weekend. Two extra days would help so much. I'll take one, if that's the only offer! Anyway, I have four per cent left on the battery, and I need to tell you that today sees the launch of the last Challenge of the year at Little Miss Muffet Stamps... Anything Goes. See, I'm so caught on the hop, I'll have to pop back later to add links and Copics used. I don't know, you'll be telling me there are only three weeks until Christmas next!! She looks so cute Faye!! Gorgeous colouring as always Faye and yes time is flying by too fast. Oh my goodness...if I had just a teensy weensy bit of your talent, I'd be thrilled. I so admire your coloring abilities. Sorry, though, can't give you a couple more days though. Just so beautiful with lovely fresh colouring. Love the twine bow. I want a pair of those stockings!!! Love your card too, but I really do NEED those stripey tights! Erm. It's Thursday today. I'm missing Tuesday. If you see it let me know cos I have a sugar craft class to go to!! Super CHRISTMAS card BTW. hugs Muver. These Thursdays just sneak up so fast Faye..gorgeous image and colouring and super design. Such a sweet image, amazing colouring and I LOVE those papers too. 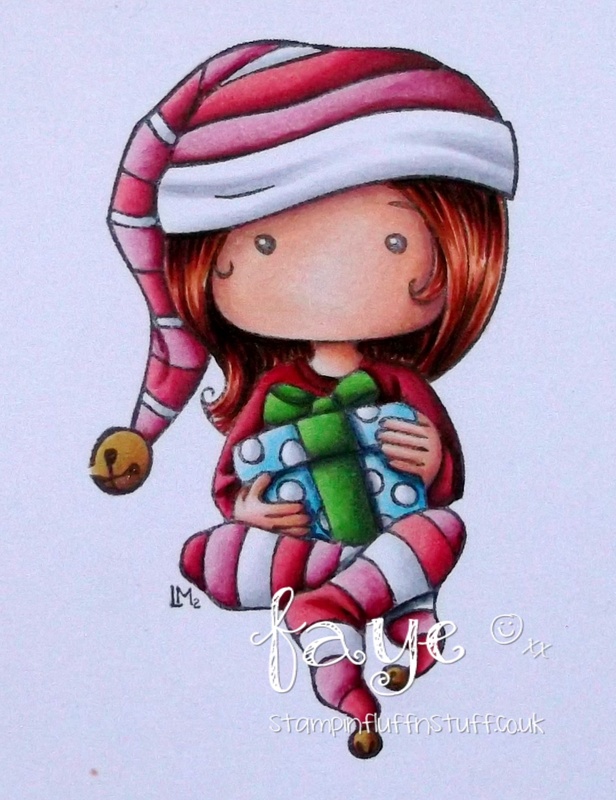 Gorgeous card Faye, love the sweet image and AMAZING colouring hun. Thursday already! eek! Where is the time going? Great use of papers and the doodled frame is a nice touch and gives this cutie something to sit on. Sweet! Loooooove this Gorgeous Card. Fabulous Colours and Papers. Have a Great Week! Love love love everything about this? This is so gorgeous, I love the colours and your beautiful layout!